The Edge-EZE™ lawn edger maintains clean, sharp turf edges along sidewalks, roadways and driveways, eliminating time-consuming secondary trimming and reducing edging time up to 75 percent compared to hand-held string trimmers and walk-behind wheeled edgers. 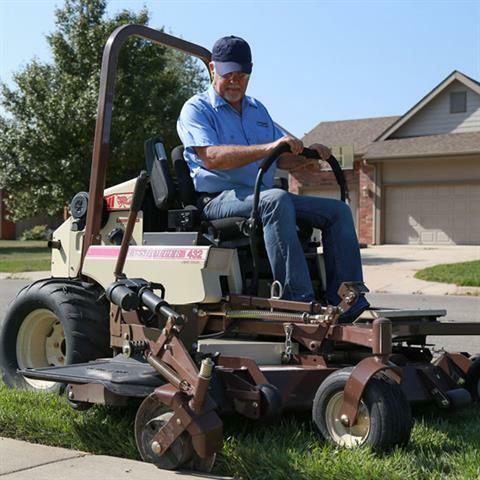 Compatible with all Grasshopper MidMount™ and FrontMount™ zero-turn mowers, Edge-EZE™ mounts on either side of the deck for superior flexibility. With a 2-1/2 in. depth of cut (from hub to edge of disc), Edge-EZE™ is perfect for maintaining established edges at up to 500 ft. / min. Twelve-inch vertical adjustment lets you edge from the sidewalk, turf or curb, depending on your needs. Dependable, heavy-duty construction makes it ideal for commercial use.